Around fifteen – twenty pupils attend Earlybirds, playing and chatting before school enjoying a story at 8.35. All are welcome – no need to book, just come to the hall between 8.00 and 8.15. Earlybirds costs £4 per day. Other children enter from 8.45 – 8.55, changing their reading books on their way to class. Session starts with a revision of sounds or high frequency words learned, moves onto a new sound or spelling rule for the day, which children practise and finishes with applying the sound or rule in a series of words and then a sentence. Children generally write on whiteboards for letters and sounds. Three groups operate in each year group, to cater for different paces of learning. Spelling tests take place each Monday in Year 1 and 2. The class will gather together on the carpet with their teacher for an introduction of around 15 minutes. They will then work in groups, sometimes independently and sometimes with an adult following on from the focus of the introduction. Often a group will be taken to the canteen, playground, hall, ICT suite, library, music area or cookery area for focussed discussion and hands on learning. Sometimes a teacher will operate a carousel system over the course of a morning, with all children rotating around 3 or 4 different activities. On other occasions, children will be grouped by prior attainment and only asked to complete one activity. Sometimes the children will gather together again just before 10.00 to review their learning; this depends on the focus and timing of each individual lesson. Lessons will be based on each child’s next steps in learning, using descriptors for each stage in the Early Years Foundation Stage and National Curriculum. Often parent helpers visit during this session, to support individual readers. The overall themes of assemblies follow SEAL (Social and Emotional Aspects of Learning) units, covering new beginnings, relationships, aspirations, and changes. A value for each half term runs through the theme. Each assembly focuses on different aspects of school and home life, with a bible story once a week and lots of drama and illustrations about morals and values. There is no whole school assembly on Thursdays; instead children enjoy a more intimate act of worship in a class circle. On Fridays, children enjoy ‘Celebration Assembly’, when special events are discussed and a sense of pride in the school and their achievements is engendered. Children sit in class groups for assemblies with some selected to sit on the ‘special bench’ for particularly good behaviour or participation. A song is sung in each assembly. Children take a piece of fruit outside and are encouraged to eat this with their friends before disposing of any rubbish responsibly. Four members of staff supervise playtimes. Each class has the opportunity to visit the garden once a week. The garden contains our prayer area, which may be used by children to read a provided prayer (two or three laminated prayers are available at a time, linked into the current assembly theme and value) or just sit quietly and reflect. Lessons sometimes continue from the theme before assembly. This occurs more often in Reception, to provide these children with more time to engage in their learning. By Year 1 and 2, the children tend to cover both Literacy and Maths in a typical morning, so that new techniques can be practised on a regular basis. Lime and Apple also have a longer lesson at this time of day, so time permits for another introduction. These older children are also more able to handle the switch mid-morning from one topic to another, which is not always successful with younger children. The timing of guided reading sometimes varies. Each teacher reads with a group of 4 -6 children. By reading every day, she hears every pupil in the class in a given week. Children read a book in their level or just above. Each session focuses on a key skill from that reading level. Each child’s progress towards the skill is noted. Key skills include predicting events, adding expression, pausing for punctuation and using the context to read unfamiliar words. The groups not working with the teacher will either work on a reading activity with a TA, or read/explore phonics independently. To increase the time allocated to Maths, on occasion, this independent activity will be based on a number challenge. Children are served lunch and have the opportunity to play with a variety of toys. These vary every day, with a rota organised by midday supervisors. The area outside Apple Class becomes a football pitch. To encourage all children to develop skills in the sport, only girls may play there on Wednesdays. There is great variety in afternoon lessons. Each class has one afternoon swimming and one PE session in the hall or playground. This is generally the whole class, but will sometime be half the class while the other half is in the ICT suite or classroom with a TA. Handwriting often takes place in the afternoon, along with foundation subjects. These are generally blocked over a half term, with a full afternoon or two being devoted to Art, Music or DT. Two afternoons will begin with ‘Mighty Maths’, our strategy to increase fluency in Maths through extra practise. 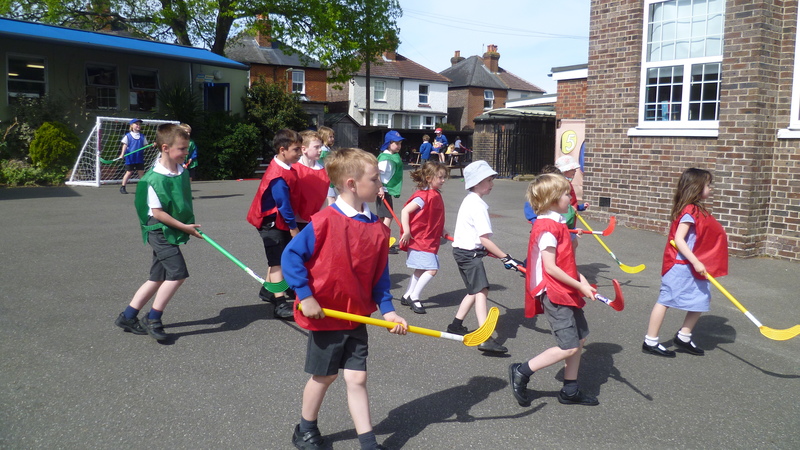 On Wednesday afternoons, children split into six groups of twenty for clubs. They rotate around Art, Cookery, Games, Nature, Dance and Drama. There will often be an ongoing task for one adult to sit individually with children to check word recognition, carry out individual reading assessments, or the next step in an art or DT project. Children will take turns to leave the main class and complete this task. There are also a number of intervention groups which take place during the school week. Most children will be involved in a group at some stage; either to provide a boost if needed, or for an additional challenge. Rehearsals for special events take place at intervals through the year, with children being called out of afternoon lessons. WriteDance takes place once a week in Reception and as needed in Year 1. This provides an excellent foundation for neat handwriting.